CEOs care about learning programs. To gain more executive-level interest, guess what learning and development folks? CEOs want metrics. Give them learning metrics. The learning metrics you may have collected and reported on might need adjustment to become important to an executive. The organization challenge that leader’s need to recognize is that an organization’s ability to learn and to adapt is the only source of competitive advantage. Development professionals only gain stature in the business environment when they meet and plan business solutions. The ROI Institute and Chief Learning Officer magazine have a study recap that should provide a clearer map of our worth. The targets of this survey were CEOs at Fortune 500 companies and the top 50, privately held firms. From this population 450 firms received a survey and 95 firms, 21%, responded. The average response: 3.2, meaning the CEO is more than three levels removed from their L&D executive. The column on the far right lands the case for change in our relevance: impact and ROI. Impact and ROI are number one and number two in “ranking of the importance of this measure”. The first rule in communication: know your audience. If we were unsure before or banging our heads against the wall looking for an opportunity, we now have gold to work with from these results. Consider these results as if you had a direct conversation with your CEO. Consider what is relevant for the CEO’s need to understand. Have you justified the budget that classroom training is only about 20% of learning? An organization’s ability to learn and to adapt is the only source of competitive advantage. Our ability to become, or remain, relevant also comes down to an ability to learn and adapt. The best learning evaluation I have come across to marry training for business results and measure impact is Kirkpatrick Model. Any trainer worth their salt knows of the Kirkpatrick Model to evaluate demonstrated training business partnership. Important to note that you need to build Level 1, then 2, then 3, to get to Level 4. Each level below builds ability to meet the next. 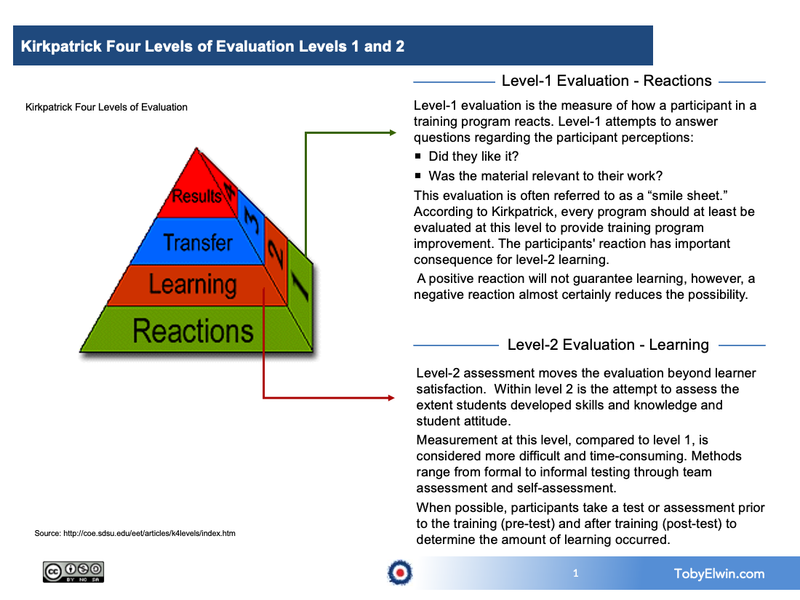 You can not jump to Level 4: Results without accomplishing Levels 1: Reaction through Level 3: Behavior. To introduce The Kirkpatrick model you may begin to build programs that accomplish Level 2: Learning, reliably, then as you build awareness of these results add feature elements to accomplish Level 3: Behavior, and so on. Kirkpatrick model a great resource. 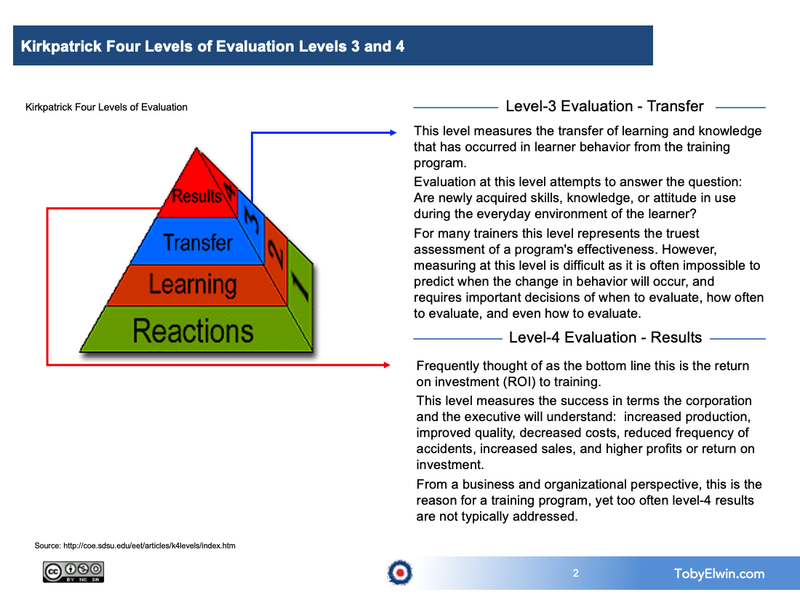 Agree we should measure level 4 results more often. As you indicate that takes time and effort. How can we convince our organizations that this investment is worth it? Convincing an organization to do any investment should come down to benefit cost analysis. Track the investment, plot the expected payoff, identify the time value of money. I would not be comfortable proposing any investment otherwise. Organizations too often have personal (political) cases for investment, not business cases for investment. The great value of Kirkpatrick is the tie to return on investment and time. If we are not prepared to offer that, we do not deserve to get listened to. Even when a business case is made, politics certainly trumps ration, but at least we backed up a business. The only way to get invited to a business discussion is to be able to have a business discussion that ties to risk, reward, investment, estimated payback, and net value. Other than that, a rational actor, as economists like to say, have predictable results. Tell me, Kevin, and thank you for the comment, what is the success tactic to have human capital investment decisions part of overall financial capital decisions? As money and time both represent finite resources, your strategy to focus on select triggers would make any business person proud. 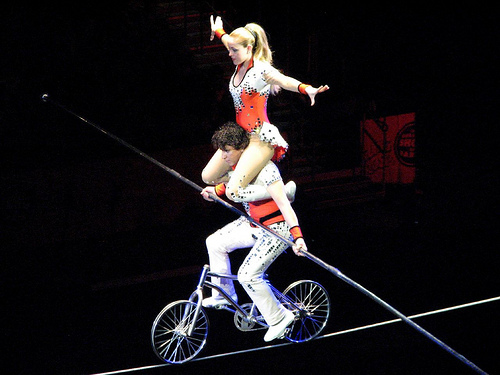 The extreme value with social media ‘likes’, ‘retweets’, comments, bounce rates, and average time on site, are all analytics to plow back into what to do more of, what to stop doing, and what to continue doing. Measure and manage are reasons that drive my social media training objectives I have for organizations, classes, and people: launch and manage not launch and abandon. Kevin, I very much appreciate your contributions to the site. So, how will you control your learning and who, so far, have you found as a good source in social media?